Two excelent plots of 20.124sqm and 17.887sqm, sited at the end of the non protected extreme of the Rambla de los Molinos, in Totana (Murcia), at the foothill of Aledo village. The area is being incresingly protected due to its landscape quality and a variety of cultural and environment care programmes that are being developed. 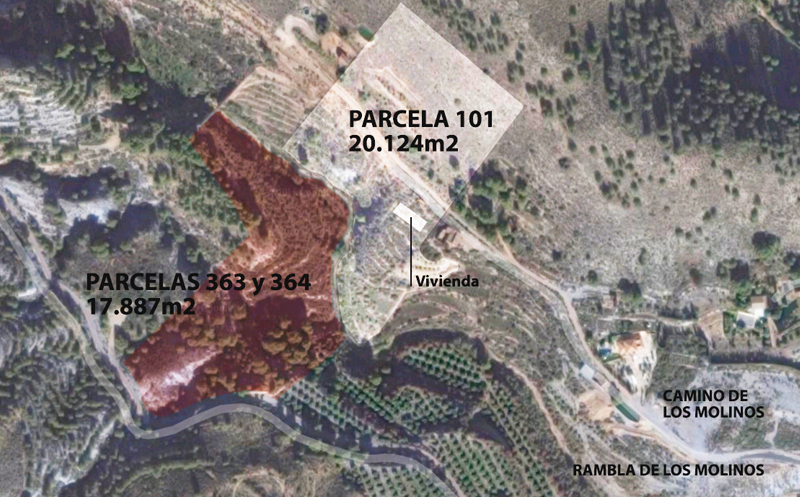 The plots are the last ones that are not property of the Administration y it is the last chance to legaly build in this location due to the restrictions of the new Masterplan of Totana. The bigger plot has an urban license, approved on November 2016, to build an isolated single house of one level and 174sqm. It is not possible to build a house in the smaller plot and it is on sale independently, so it can be acquired alone or together with the other as an extension of it. The plots are property of the architect Pablo Carballal, who is also author of the approved house project. The license is granted for an isolated one family house in a labour terrain. See the house project here. The house is inspired by the traditional architecture of the area and it is a contemporary reinterpretation of it. Agricultural, desertic and mediterranean, this constructions are characterized by compact and massive volumes, clear and earthy tones, sun radiation control by means of openings limitations, fresh and austere interiors and fertile and cultivated exteriors. A series of simple design decisions seek to adapt the house to the site climate and topography. The mandatory 15m set-back from the road (Camino de los Molinos) and the strong steepness of the terrain suggest an elongated shape, that fits to the existing natural terraces and at the same time allow all the rooms to be open to the landscape. 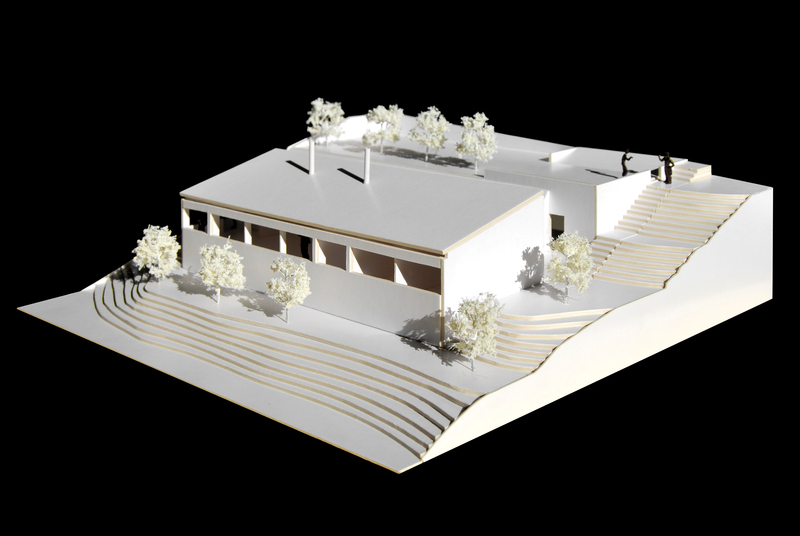 The inclined one plane roof, parallel to the hillside, protects the interior from excessive radiation, and the partial house burial benefits the thermal insulation and reduces energy loss. The access occurs from the road at the top. Next to it, there is space for three vehicles and the begining of a descending path that leads to the main door between lemon and orange trees. The house is set in one level and it is divided in two bodies. One for living, dining, kitchen and terrace and one for three bedrooms, two bathrooms and one technical room. The finishes choice seek to keep the spirit of the region vernavular architecture and are summarized like this: façade plastered in a clear earthy tone, traditional roof clear tiles, polished concrete floors, clear openings frames, exposed laminated wood structure, interior clear and clean vertical walls. The house is sited in an isolated location and its only conexion to the municipality is the electrical network. There is a biomass heater that serves for the hot water and the radiant floor placed under the windows. Water supply is done by a certified water tank filled by a tanker vehicle and the sanitary system consists of an hermetic tank emptied by specialized company. For climate control, the internal thermal mass and insulation is increased, and special sunlight control shutters allow to open the rooms to the valley and keep control of the sun radiation. For any doubt or comment please get in touch.